Sgt. Rourke, Service No. 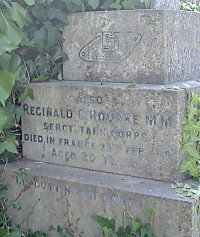 201624, of the Tank Corps was the son of George and Amy Jane Rourke and husband of Rene Isobel Rourke of 67 Tredegar Rd., Southsea. Reginald married Isobel (nee Dawkins)at Westbourne in 1918. He is buried in the St. Pol British Cemetery, St. Pol-Sur Ternoise, Grave Reference II.E.20. The memorial appears on his parents grave in section H of Highland Road Cemetery. Unusually, there is an image of a tank above the inscription.